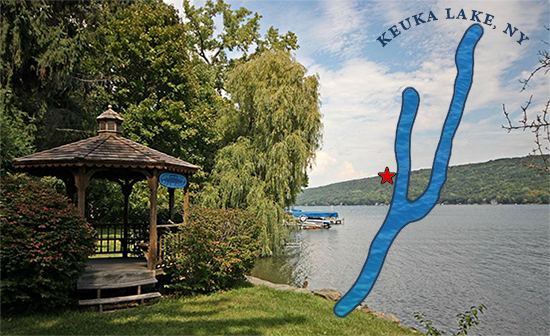 Come relax in the peaceful setting of our 1887 plantation-style bed & breakfast, nestled near the pure Keuka Lake waters, swimming, and foot paths. Enjoy calming views of nature, fireplaces, A/C, sumptuous breakfasts, superior restaurants & wineries within 5-15 min., Wi-Fi and more. Many guests enjoy walking the many trails on our 9 acre estate and swimming in our private cove or just enjoy the tranquilizing effect of gazebo gazing as the sounds and ripples bring relaxation. Everyone enjoys chatting around the breakfast tables while they relish breakfasts of fruit, home-baked Rhett’s Rhubarb coffee cake, one of Aunt Pitti Pat’s many flavors of pancakes or perhaps Ashley’s stuffed French toast & Scarlet’s scrambled eggs, and more….